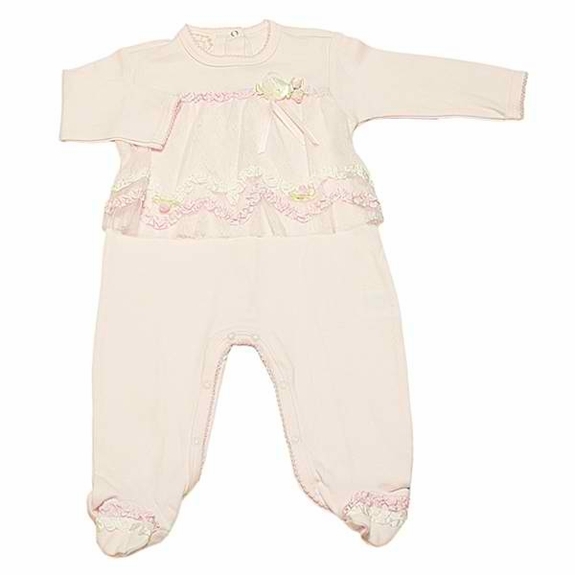 Ribbons, rosettes and ruffles frolic across the sheer Baby Biscotti - Sweet Chantilly Footie Baby Biscotti Sweet Chantilly 100% Cotton Footie. comfy cotton. Tiny ruffles frill the toes for a delightful finishing detail. -Snaps at back and between legs. -Kids' Wear. Infant sizing: 3m=10-12lbs, 6m=13-16lbs, 9m=17-19lbs, 12m=20-22lbs, 18m=23-25lbs, 24m=26-28lbs.